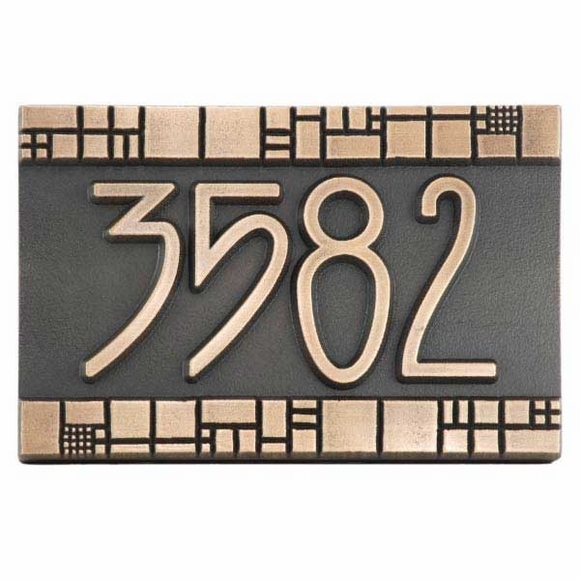 Address Plaque with Geometric Border - - decorative and very unique 16"W x 10.5"H personalized address sign. Wall mount. Made in USA using American materials and labor. Signs are an impressive 1" thick with raised Arts & Crafts lettering. Seven upscale metal finishes: bronze patina (shown in large image), bronze verdi, copper patina, copper verdi, brass patina, silver nickel, and pewter. This address plaque holds a four-character address number in raised lettering (shown above). The geometric art tile border is inspired by Ernest A. Batchelder, a leader in the growth of the American Arts and Crafts movement. Handcrafted using high density urethane (HDU) sign board, real metal coating, and marine-grade clear coat. The result mimics the characteristics of true cast metal at an affordable price and without the extra weight. Dimensions: 16"W x 10.5"H x 1". Personalized Street Address Plaque inspired by Ernest A. Batchelder, a leader in the American Arts & Crafts or Mission style. 16x10.5x1 personalized address sign.